FORMER Vice-President Phelekezela Mphoko is being sued for $2,1 million by a Bulawayo businessman for alleged abuse of office. The businessman says the former Vice-President allegedly used his influence to stop a company owned by Pakistan businessmen from compensating him after they delivered expired flour to his bakery. According to summons filed by Mr Mthonisi Nsingo, the proprietor of Dial Direct Enterprises (Pvt) Ltd which owns Double Fresh Bakery, at the Bulawayo High Court on Friday, the former Vice-President is being sued together with the company which supplied the expired flour — Bulk Commodities and its directors Imran Shazaan and Qaumar Shazaan. Mr Mphoko, cited as the 4th defendant, allegedly used his then political office to defend the Pakistan businessmen and stop them from compensating Double Fresh Bakery for the supply of rotten flour which resulted in loss of business and subsequent closure of the firm. According to the summons, it is alleged that sometime in February last year, Bulk Commodities intentionally supplied Double Fresh Bakery with expired flour. It is said Bulk Commodities continued to supply expired flour until July culminating in Double Fresh Bakery experiencing a significant drop in bread sales. “This continued from February 2016 to July 2016 with the plaintiffs (Double Fresh Bakery and Mr Nsingo) initially believing that the problem was with their marketing strategy as sales went down drastically with 70 percent of the bread being returned to the plaintiffs. “The plaintiffs would deliver 10 000 loaves daily but within time, daily production went down from 10 000 loaves to 2 500 loaves and bread shelf life was shortened from six days to two days. The plaintiffs were eventually reported to the Consumer Council of Zimbabwe and investigations were carried out which revealed that the problem was with their flour. The flour did not look rotten but in actual fact it was,” read part of the summons. Sunday News broke the story then, which was titled: “Flour row costs bakery $18k in revenue” in its 15 May 2016 publication. The summons stated that when Mr Nsingo approached the Shazaan brothers, the two took a sieve and some unidentified liquid which they used to “clean” the flour and the product appeared to have been rectified. Mr Nsingo reportedly managed to film the “cleaning proceedings”. “Subsequently, investigations were done against the 1st and 3rd defendants and they were arrested, when they were raided they were found to have in stock expired goods which they were selling as well as expired flour. 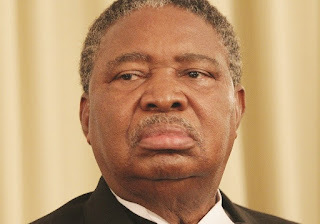 “At that stage, the 1st and 3rd defendants had acknowledged liability to pay plaintiffs and had made arrangements to pay plaintiffs, however, at just about that time they refused to pay claiming that they were under the protection of the 4th Respondent (former VP Mphoko),” read part of the summons. It is said Mr Nsingo later received a call from the former VP’s principal director Dr Temba Ndlovu instructing him to visit his office for a meeting with Mr Mphoko. It is further claimed that during the meeting, Mr Mphoko “uncategorically” told Mr Nsingo to leave the Shazaan brothers alone. “After that all charges against the defendants seemed to disappear and nobody wanted to pursue the matter for plaintiffs’ compensation as everyone simply said they could not assist the plaintiffs because they received instructions from above,” read part of the summons. Mr Nsingo says his bakery was forced to shut down due to lack of adequate working capital as a result of Mr Mphoko’s intervention into the matter and action to protect the Shazaan brothers from compensating him. The entrepreneur had his property attached and the matter is still pending at the Bulawayo magistrates court. “This was clear abuse of office from the 4th Respondent (former VP Mphoko) which abuse resulted in pecuniary loss to the plaintiffs as they could not be adequately compensated by the other defendants simply because of the protection they were afforded by the 4th respondent,” read part of the summons. According to the summons, Mr Nsingo is claiming from all the involved parties $1,7 million being loss of earning capacity and profit due to closure of his company and investigation from December 2016 to the date of issue of summons at the rate of $200 000 per month. In addition, he is also claiming general damages amounting to $200 000 from Mr Mphoko for shock, pain and suffering as a result of his abuse of office in protecting the Shazaan brothers from being prosecuted or paying him. He is demanding another $200 000 from Bulk Commodities and its two directors for general damages for loss of goodwill and reputation as a result of low estimation in the eyes of the public created by delivery of expired flour.